There were at least three centers of civilization that arose in the ancient near east. 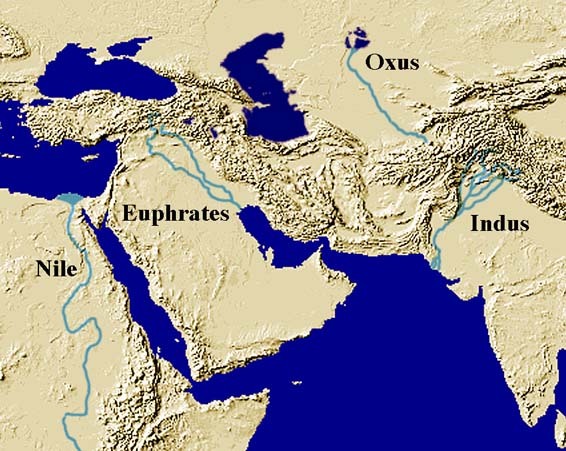 They were Sumeria, Egypt and the Harappan culture of the Indus Valley. One other early civilization is the BMAC the Bactria-Margiana Archaeological Complex or also known as the Oxus civilization. At this time it does not seem to be as old as the other three but it is too early to tell. It may well hold surprises equal to that of Sumer. These three great early civilizations gave birth to a wealth of god and goddess legends. Transformed and reinvented by the river valley civilizations the basic legends of the 100 were exported around the world and passed on from generation to generation to the presented time. At the core of these legends are the gods and the connection to Heaven. This connection was the axis mundi, the world tree and serphaic transport. Even from the earliest times was the concept of the soul, Heaven, divine beings and immortality written about, prayed over and sought after just like today. What cannot be over emphasized is the impact the 100 had on the history of the planet including Adam, Eve and "Enki". One interesting feature of these three civilizations is the time line for the appearance and growth of these cultures. Very roughly they started at about 3500 BC and lasted until 2000 BC. What was it that happened that three (and possibly four) civilizations came into being at the same time - and relatively close - given the long period of time where early human progress was only stone age? What the ancients have written is that it was divine intervention. That is that civilization was a "gift from the gods". So positive were they in this belief that they were absolutely obsessed with events of the past. So powerful was its imagery, ritual and oral traditions that the religion of Sumer influenced the entire near east and beyond. So easily were these beliefs assimilated into all of the River Civilizations that this acceptance must derive from a well known common source. A source encoded within ANE traditions. Linguists cannot speak for the Indus Valley as their "script" has as yet to be deciphered, if it is a true language at that. But imagery of the Harappan shows in part similar roots to that of Sumer and Egypt. The most obvious is the Tree of Life and the ever present Enki. The story of the Tree of Life with all its different interpretations is the strongest cohesive legend shared by the three great river valley civilizations. The tree is called by different cultural names. It is the Mes and Huluppu tree of Sumer, the Pipal to become the Bhodi tree of the Indus Valley and the sycamore-fig tree (Hathor's tree) in Egypt. Those who study ancient cultures call it a sacred tree. From the legend of the Tree comes the gods, immortality, wisdom, cosmic axis, fertility cults, serpent cults, divine kingship, the first humans and paradise. Even the Mother Goddess cults may spring from the Tree as well. Following are different aspects of the Tree of Life interrelating as they do in a malleable and plastic way. These differing concepts from the Tree expressed themselves as a remarkable and far reaching cultural impact. The Tree of Life was fertile in many ways. Below are five pages of legends and symbols. Taken as a group these symbols and meanings although labeled with differing names still at their center contain original truths. They are from an ancient family sharing attributes and being redefined according to the differing cultures of that distant time. 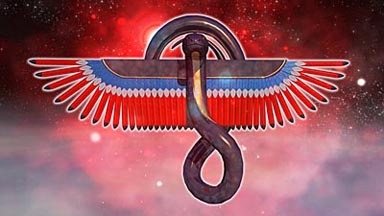 From Sumeria to the Roman empire we can see the longevity and diversity of these symbols connecting Heaven and earth.